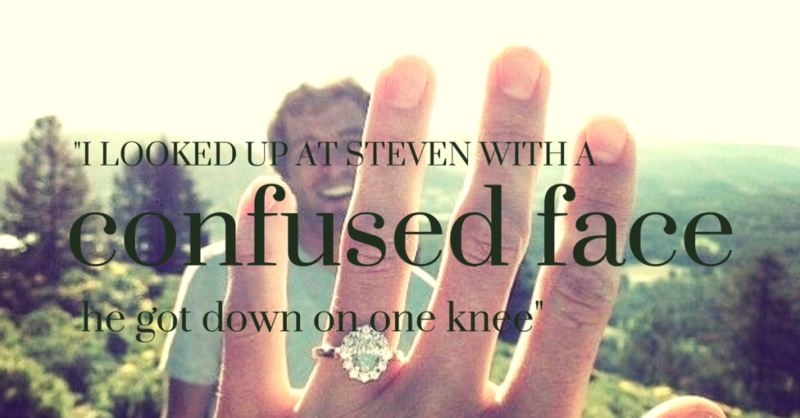 Beautiful Engagement Stories That Will Make You Laugh and Cry! Are you ready to laugh or cry? Whether you’re here to steal some inspiration for your own wow-worthy engagement. Or you simply want to bring back wisps of nostalgia from your own proposal. These proposals are all real and are all told by Brides who entered our Proposal Competition back in May. From the oh-so romantic Parisian proposal to the lady who confused her engagement with a micro pig; take inspiration, a smile or a tear from these beautiful engagement stories. We had been out for lunch that Sunday (16th February 2014) afternoon and we were asking my daughter if she would take my partners name IF we got married. He then joked that he would have to propose using a hula hoop as he didn’t have a ring. On the way home my partner popped to the garage to buy something. Later that evening I found out what he bought when he got down on one knee and proposed with a hula hoop. At first I thought he was joking, but he wasn’t. I kept the hula hoop ring but I do have the real thing now! So it all started with lots of mysterious visits to a mate’s house to “help fix his car”. He was being very secretive but I hadn’t a clue what he was planning. He kept joking around with me about how he would propose “next year” if we had the money. My birthday came round and a sneaky little box appeared – it was earrings which left me thinking that it wasn’t going to happen anytime soon. We saw in the new year and at 2 minutes past midnight with a glass of champers in hand he tells me to meet him upstairs. Cautiously I took of my heels and followed him upstairs. I turn the corner into the bedroom an there he was on one knee ring in hand! It was would have been my dad’s birthday, he passed away suddenly while in Egypt the year before at just 55 years old. While at the cemetery laying flowers at his grave my fiancé said I’m going to ask you this in front of your dad’s grave as it’s a special day and a special place; will you marry me? We were both crying and I was so happy such a sad day ended very happy. I gave birth to our beautiful daughter Sophie in November 2013. My partner Steven had always said he didn’t want to get married so I never really thought about it. Christmas day we opened our presents, Steven took our daughter in the bedroom and said we had another present for me and to wait until they returned. I had no idea what was going on. I thought he had bought me a watch as that’s what I had asked for. Sophie was wrapped in a blanket, I opened the blanket & she had been changed into a vest which said ‘Mummy will you marry my Daddy?’ As I looked up at Steven with a confused face he got down on one knee and popped the question. Before I could even get my words out I started to cry. Christmas 2013 is definitely one to remember we plan to marry in 2015. Me and my boyfriend went to Sicily for a long weekend break, one of the things to do on our list was to take a trip up Mount Etna. It was an amazing experience. So calm and sunny at the bottom but as we travelled up in a cable cart it became windy, sight was limited and the snow was getting thicker. We got out and went for a walk, in a blizzard! It was windy, the ice was burning my face and my eyelashes turned into icicles. We kept walking until it became unsafe to go further and made our way back, we took off our snow boots and I was told to wait a minute. I had no idea what was going on until he reached inside his jacket to his pocket and out came the ring and a proposal of marriage. I could not believe it but of course I said yes! The ring in its box made its way in to my pocket and we made our way indoors. This is someone who isn’t especially romantic and has never given me any reason to believe that one day he would ask me to be his wife. He made me the happiest girl that day, what an experience and what a proposal, one I’ll never forget. A surprise drive down to the Lake District, where my boyfriend had planned for us to have breakfast for us, accompanied by a stroll down by the lake. We walked on to a promenade full of boats. Where we were greeted by a gentleman, handing hand with a beautiful bunch of flowers- Lillie’s my absolute favourite. The flowers were handed to me and we were then escorted onto a beautiful white yacht. Where we sailed along the lake surrounded by beautiful mountains and sceneries. It was perfect, we both had a go at sailing the yacht which was so much fun. Underneath the yacht in the below Scott had prepared to ask me, there to marry him? I of course said yes!!! We sailed back to land and ended in a beautiful old traditional, next to a log burning fire, drinking champagne and eating a traditional old roast. Perfect day, truly romantic!